When someone struggles with addiction, it impacts so many others around them. But for the Tebbets family, the pain was especially acute. That’s because both of their children were addicted to drugs. Recently we were able to sit down with Gail Tebbets and her daughter, Sarah, and talk about their family’s journey. Here’s their story in their own words. Teen Challenge (TC): How did you first hear about Teen Challenge? Gail: I have a husband and two children (currently 32 and 30) and we have some Dutch friends from Holland who used to come back and forth and live here in the United States. The Teen Challenge choir came to sing at their church and they invited us, not knowing that we would ever need help from Teen Challenge, just to go to one of their services. So we went and it was very touching. The girls sang and gave their testimonies. TC: Gail, tell us about your daughter, Sarah. Gail: I didn’t know the extent of her addiction but she was addicted first to pain pills. Probably started about age 20 on a little basis, just to get through life and feel good, and it eventually ended up with heroin. We always pleaded with her, “Can’t you just stop? Can’t you just stop taking pills?” “How many pills do you take, Sarah?” “Oh, just about 10,” she would say. By the end of her addiction, she let me know she was taking about 60–80 Oxycontin a day. And she’s not a big girl. Unfortunately, she got arrested for shoplifting and selling the clothes back to the store to get money for her addiction. That’s when we knew this was really bad. So she went to a non-Christian rehab—like everybody tries. We thought she did well but she said, “The day I came out I shot heroin.” That program did nothing. She stayed two weeks. We thought that would be perfect and it would get [the drugs] out of her system and she’d be better. But it didn’t help. So then she started stealing checks from me and took a few thousand out of my bank account. Then I knew it was bad again. At that point we called our friends and said, “We need some help possibly getting Sarah into Teen Challenge because this isn’t working. Our pleading with her isn’t working. Our crying and…we’re just scared for her and she can’t live this life.” It wasn’t her. Sarah: I was just trying to fit in with the cool kids. Gail: Trying to be cool. But then none of her friends ended up this way so I don’t know how it happens to one person and not the other. She had a good upbringing. Her dad and I have been married for 36 years. She has a nice, stable home. Her dad and I have long-time jobs, so we just couldn’t figure it out. TC: Sarah, what did you think about Teen Challenge when you first heard about it and that it might be a possibility for you? And then, going in, I told myself, “I’m only going to go just until I detox—one or two months and then I’m out of there.” But God gets a hold of your heart and things change. I went through induction in Bakersfield, then I went through the rest of the program in Ventura and then did my apprenticeship back in Bakersfield. My first day in Teen Challenge was in April 27, 2011. I graduated on Mother’s Day in 2012. Gail: As much as someone will tell you about a program, you don’t know what it’s like. Of course, I was scared for her. I would just pray for her, “Please just stay there, Sarah.” They [the Teen Challenge induction staff] say to make sure and leave bus money for them to come home. You have to have $50 on the books in case they want to walk out. I would just pray, “Please don’t let her walk through the door. Please don’t let her come home.” I would look at YouTube—all the Teen Challenges on YouTube—just to get a feeling for what they were doing there. And I cried every time I watched them, but I just felt good about her there. I felt she was safe. I didn’t know the life that she lived in her addiction. Addicts are very shady people. They do shady things. And I just can’t imagine my children dealing with a drug dealer. Lying . . . I can’t imagine that lifestyle. TC: Your son also went through Teen Challenge, didn’t he? But Sarah knew different, obviously. They’re very close and she just kept praying for him and actually, all the girls at Teen Challenge—one addict knows another, I think. They would see him and they knew he was high coming to the Family Days, and they all prayed for him. She asked for prayer for him and Sarah fasted for him and she just did everything she could but he still was not ready to give himself up. Every time Sarah was in a choir event that was local, I would go. If it was two or three or four times a month, I’d show up. I was just so happy to see her! I wanted to be supportive to her and the other girls because they became very close to me also. So we went to a dinner/choir outing in Camarillo and I told Brian, “Make sure you go.” So he said, “Yeah, yeah. I’ll show up. I’ll be there.” And he came in really late. You know, one of the things addicts do is they show up late because no telling what they’re doing. They’re getting high, or whatever. He was probably about a half-hour late. He walked in and I could tell he was high. I was very angry with him for showing up at a Teen Challenge event in the condition he was in. He gave me a hug and was very happy, go-lucky, but you know, everybody knew, especially the Teen Challenge girls. They lived that life. So Saturday night was the choir event and Sunday night he got arrested for possession of heroin. Very, very small amount, but still it was heroin. I had told my children not to call me if they were in jail because I wouldn’t pick them up. So he didn’t come home for a couple of days but I knew where he was. I had looked on the jail list and saw he was there. Brian says that God came in the form of handcuffs. It really gets to you but I think that’s probably true in his case. Kern County Teen Challenge found a bed for Brian and so we drove him to Shafter and…haven’t looked back since. He’s just grown into the most wonderful gentleman. I can’t say enough for Teen Challenge. They help you heal from the inside out and that is absolutely true because their hearts have been softened and they’re just really good, hardworking kids right now. They’re both fulltime employed, paying a car payment on time, just doing well. Brian hadn’t worked for years. I’d beg him, “Get up, go look for a job.” And he’d just sleep all day. I hated his lifestyle and I would knock on his door and make sure he was there. You know, it’s awful to say, but if he would say, “Hi, good morning!” then I knew, ok, he’s alive. He made it. He graduated February 2013. And he also did an apprenticeship of four or five months in Riverside. They really felt that after they graduated, they grew from the extra time spent at Teen Challenge, and giving back and helping—it’s good for your heart. TC: So what are they doing now? Gail: Sarah is a Business Manager for Scofield Catering. When Sarah got out of Teen Challenge, she had a police record because she was arrested for first-degree burglary for shoplifting with two or three counts against her. So we were telling her it’d be difficult to get a job, but she called this company, shared her background and they decided to give her a chance. Sarah: I’ll be working with two Teen Challenge women in two weeks. We are using them to help with a big event that we have coming up. I try to stay connected. I want to be a tool for the girls because coming out of Teen Challenge can be a kind of scary thing. You’re under such a covering, you’re under an umbrella there. So it’s hard to imagine your life moving forward and it can be a scary thing but I can be an example for them. I share my testimony so it’s good that I’m still plugged in that way but I get to help them. Whenever we have a big event, I can call Miss Rosie [Weir] and, you know, they’re right there. Gail: Brian would be the one to lag on everything. But when he got out of Teen Challenge, he got all his certificates and went before the judge and they dropped his case. They took it off his record. He had a felony and with that, it’s like, “Oh, Brian, you’re not going to be able to vote, and all sorts of things.” And the judge listened to him and said, “You know what, I think you’re a changed man and I see all you’ve done, your apprentice paperwork, these Teen Challenge letters of commendation, and I’m going to drop your case. I’m going to take it off your record.” I couldn’t believe it! I was like, there’s no way! But sure enough, it came off! Thank you, Lord! So we’ve been through Teen Challenge and now the addiction is out in the open. It’s opened up dialog to a lot of things in our family now. Before we couldn’t discuss things and now, we just bring it up. Now we all go to church together every Sunday, then we go out to breakfast. It’s our family time together. We’re so thrilled our children are back with us…and clean! 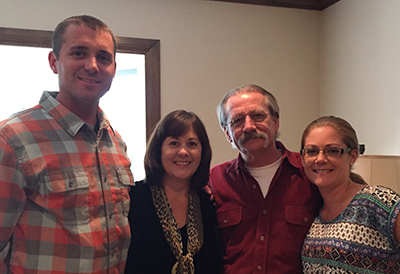 With the help of our supporters, Brian and Sarah—and the entire Tebbets family—have a new life free from drugs. But there are so many others still asking for our help. Will you please make a generous gift today to help another who needs to know that there is still hope for them?